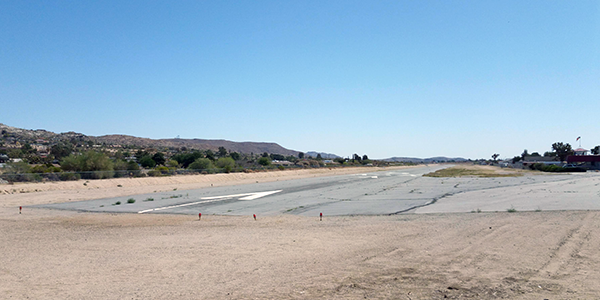 The 35 acre airport facility is leased long-term to the Yucca Valley Airport District comprised of the responsibility of a 200 acre radius around the airport. This airport we are so proud of, it is a private aircraft, no commercial traffic airport. The airport is well maintained and it sits within the Yucca Valley “U” shaped boxed in mountain ranges, these mountains have peaks at around 4000 foot elevation, but the airport is already at 3224 feet in elevation. To the north, west and south, the mountain range is like the bottom of an open “U” horseshoe shape and the opening faces east towards Joshua Tree and Twentynine Palms opening. While you might think these mountains protect the airport from high winds, all we can say living right at the airport is that it does not protect the airport of our home and business from the winds. So aircraft landing and taking off are not partially protected from the often windy environment we would expect to experience due to our location, the desert pressures etc. Airport Code L22 (airport location identifier). There is no Control Tower, we have a wind sock. The airport sits on 35 acres of land at an altitude of 3224 feet. This is a single runway airport is 60 feet wide by 4363 feet in length. Left 24 ends at State Route 247 and is about a half mile northeast of Yucca Valley’s central business district. 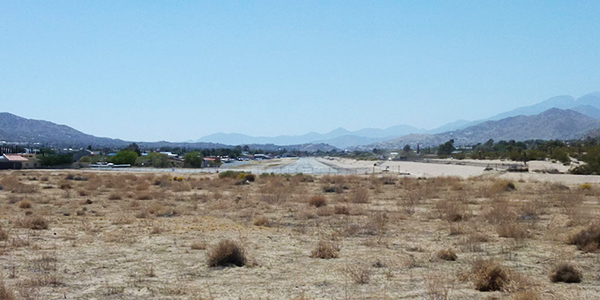 The airport runway runs along side the town of Yucca Valley main low point, a 5 foot in depth drainage canal named the Yucca Wash. The airport has only minimal aircraft structural and power plant services for airplane repair. Who utilizes the Yucca Valley Airport? We see planes both single propeller, twin propeller, turbo propeller and small jet aircraft parked in the aircraft visitor parking next to the Airport Bar all of the time. There is a 24 hour convenience store west of the aircraft parking area across the two lane State Route 247 you can easily walk over to. The airport has nice homes around it, mostly along the south side, and a few separated across the Yucca Wash along the north side of the airport and these homes. Many of these homes have private aircraft hangers, so it is like a garage for your car, which most have one of them in front, but around the back or on the side of the home facing the airport runway is their private airplane hangers. There are also many airplanes actually parked on the south side in a cutout along the main runway. The San Bernardino Sheriffs Department also utilizes the runway for their helicopters when activities are requiring their assistance, law enforcement search and rescue in the Joshua Tree National Park or for major off road events. The Air Ambulances also utilize the airport for helicopter flights of people in need of greater or timelier life threatening events by being flown out of the Morongo Basin to the larger hospitals 40 and plus miles in nautical distance. We do have a hospital named High Desert Medical Center (59 Emergency Room Beds) open Emergency Room 24/7-365 in the area of Joshua Tree, California, and it is a good place, it is not a level I, Level I Pediatric or Level II Trauma Center, it does have an Emergency Room. The coolest airport activity we see (all of the time GO USA) is when the military from Twentynine Palms Marine Base utilize our airport flying over it and into it, these are mostly low flown over by Marine Helicopters sometimes they land and it is really a great thing to see and enjoy watching the armed forces service members circle the airport rattle our home and so on. It is really loud and being from the aerospace industries since the early 1970’s, it is even more enjoyable to us. We can actually see the pilots and personal inside the aircraft when they fly in or around the Yucca Valley Airport. The airport was built and placed into operation on January 01, 1958. The only history we have about the Yucca Valley airport is when it opened and then at a later date when a courageous man and his friend set out on a journey to build a transport aircraft on the south side of the airport and on the same street Active Atom is located on. 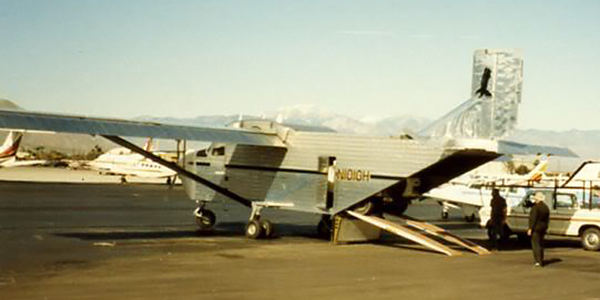 Ernest “Ernie” Hauk (that is the actual last name not Hawk) and designer Larry Stewart set out on a mission to be a competitive builder of small cargo style aircraft and that mission took place right here right on our street Aviation Drive. 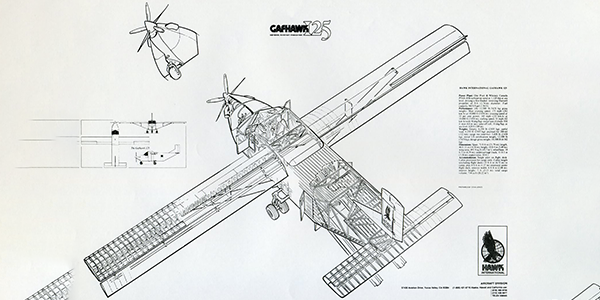 Designed, developed and manufactured as a general aviation freighter the GAf-125 GAF-Hawk aircraft. The design a square shaped maximum cargo ability size and was a single engine turbo propeller engine a 1.5” x 1.5”steel chromoly tube frame gig welded internal frame and aluminum skinned exterior. The wing span was 71.5 feet. The engine was a 5 blade reversible propeller driven Pratt and Whitney. The first flight was on August 19, 1982. Before the flight of the first GAF-Hawk 125. There was a prototype aircraft named the MiniHawk short yet functional for testing while powered by a Piper TriPacer engine and it first flew in 1978. The aircraft is long since gone, in 1990, as the company never received FAA Certification, however the buildings, a row of 5 and 3 behind nearer the airport runway that extends east from the original headquarters at 57430 Aviation Drive are located directly across the Aviation Drive from our Active Atom home based precision machine shop. Active Atom is located in San Bernardino County in an area the county describes as the airports south residents and relatively intense commercial business activity area of the airport, we are about center (a little southwest of center technically) to the runway on Aviation Drive commercial vehicle authorized truck route, we are on the south side of Aviation Drive from the airport next to the San Bernardino County Fire Division 4 Headquarters that proudly houses the Chiefs offices (these guys are their 24/7 365 days a year , responding to major incidents from their offices. The SBCFIRE are our only neighbors and they are friends of Active Atom and the two of us.